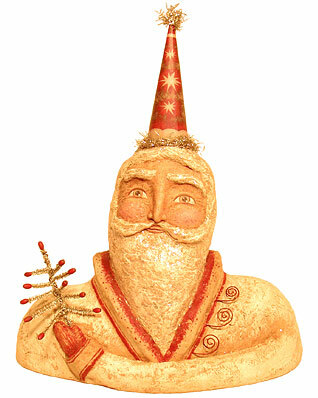 Twinkling Nicholas is a hand-sculpted and painted one-of-a-kind bust. He holds a handmade feather tree complementing the shimmering vintage tinsel which trims his red party hat. Wire swirls painted in red add texture to his robe, and his beard twinkles in a light dusting of mica flakes.